This chapter presents an overview of the September 2014 controversy surrounding Facebook's enforcement of their “real name policy,” the disproportionate targeting of drag performers for profile suspension, and the queer community's brief exodus to the network Ello. 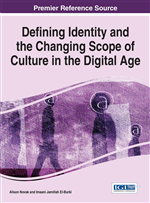 By drawing on research about identity in the online age, queer and subcultural theory, and the concept of affordances in social media, the author seeks to illuminate some of the causes of this incident, and the motivations of the actors involved. The online profile is framed as a locus for the construction of alternative identities—particularly those which challenge gender norms—as well as tension when that process is restricted. The author attempts to locate this concept of profiles, and the networked communities built from them, within a larger web of capital relations, exploring how the online and offline intersect therein. In September 2014, social media giant Facebook began enforcing the latest version of their profile name policy, which dictated that users use their legal name or some closely-related variant of it for their profiles. While the company’s help center states that the purpose of the policy is to weed out “fake or malicious accounts,” this wave of profile suspensions affected a disproportionate number of drag queens, queer performers, and other members of the queer community, particularly members of the Radical Faerie and Sisters of Perpetual Indulgence1 groups in the San Francisco area. Word spread chiefly through the plight of well-known performer Sister Roma, who was forced to change her profile to her birth name, Michael Williams; she characterized the policy as “unfair, hurtful, discriminatory, and an invasion of privacy” (Holpuch 2014). A petition against the policy started by fellow performer Olivia LaGarce garnered over 40,000 signatures in support of the hundreds of users caught in the controversy. As long-term frustration with Facebook’s privacy and account policies came to the foreground, and the company botched face-to-face meetings with Roma and other performers (offending many by suggesting that they simply subscribe to the pay-for-visibility “Fan Page” model), many sought a network that would be more accommodating of a self-defined online identity. Into this vacuum stepped Ello, a no-frills social network that had entered beta testing some months before. With their small population, lax policies towards profile content, and insistence to not marketing user data, the site briefly became the darling of Facebook’s discontents. At the height of the furor, thousands of users were leaving Facebook every hour for the junior network, partially due to tweets from queer celebrities such as RuPaul; founder Paul Budnitz expressed his support for the population boom, despite some concerns from new users that the site was technically inferior to Facebook in several ways (Sullivan 2014). Meanwhile, after refusing to alter their position for weeks, Facebook walked back several of their comments as a lead-up to a full apology by CPO Chris Cox on October 1. The company maintained their innocence against accusations of homophobia, and instead pointed to how their system for reporting fake profiles was exploited by one anonymous Internet user (@RealNamePolice), who boasted about their attacks against “secular sodomites” of all sorts (Hatmaker 2014). In light of their apology and re-instatement of suspended profiles, the animosity towards Facebook softened, and interest in Ello faded quickly in mid-October (Arthur 2014). The entire situation may seem to be a simple skirmish in the “#nymwars”2 or a community reacting to an isolated incident of prejudice from one homophobic user, but there are several aspects of how the situation developed worthy of examination. This chapter will explore why the name, as a symbol of gender subversion, became such a sticking point for these users. The different affordances3 of Facebook and Ello will be considered through the lens of capital, following Bourdieu: “the set of actually usable resources and powers” (1984: 114), in a social or cultural context. The ways in which a presence on one site or the other was evaluated by members of the community furthermore demands a deeper understanding of the users in question: as online consumers (and producers) of social media data, as members of the queer community, and as a subset of drag performers. These users were coming from a shared history of challenging traditional conceptions of gender and sexuality, building new, alternative identities and social groups; Facebook’s easy dismissal of all profiles not pegged to legal names as fake failed to account for the willingness to continue and defend that historical tradition.